A Thanksgiving message for my American cousins. I’ve never been to the USA but I’ve heard that it’s a swell spot. Many of my readers are from over that way. Over 70% in fact. So I think it fitting that I acknowledge your special day, particularly in view of the fact that it may prove somewhat painful this year what with recent political events. 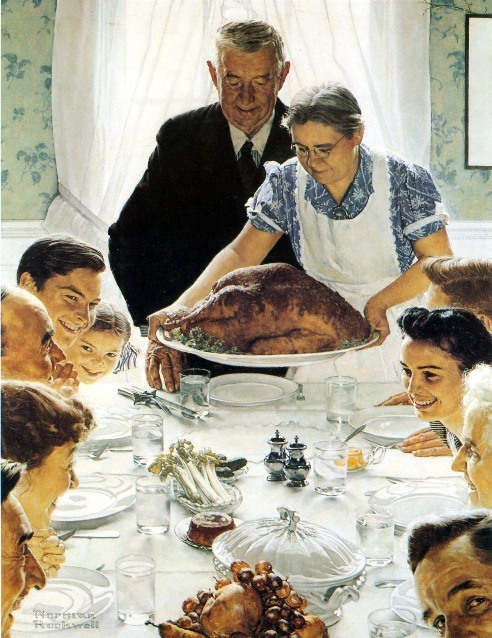 I really like this painting by Rockwell. The person I feel the most empathy for is the older woman who has cooked the very fine meal. This is her big moment and her husband is sharing in her glory. You just know how much it means to her when she places the turkey on the table. It is a very large bird and must weigh quite a lot. But her husband does not reach out to help with the burden. It is her moment and he would not insult her in that way. The other family members at the table are giving her the highest compliment possible – they are having a fine time. They are all engaged in the moment and with each other. Nobody is looking at a magazine, the equivalent in that era of a phone. And nobody is bringing up any topic that could run the risk of paralyzing the family harmony.Which would be a terrible insult to the family matriarch who has spent so much time and effort and above all love on this celebration. The little girl at the top of the table is probably more of an adult than most Millennials you would find sitting around a table today, that is if you could get them away from their safe spaces. Notice also the absence of alcohol. A prudent decision when considering if having tongues loosened is at all desirable. And of course we have the man in the bottom right corner with his cheeky glance at the viewer. You just know that he would be the first to break out cigars and begin telling funny anecdotes of that time that he got arrested for littering. I hope that you all have a very fine Thanksgiving. This year for the first time in a long time I feel that we have much to be thankful for. Science proves that only unintelligent people are activists. The inherent laziness of the beta. Both boys made it home for the holiday which brought joy to my wife’s heart. For that I am truly thankful. Thank you sir, and the same to you for Christmas.